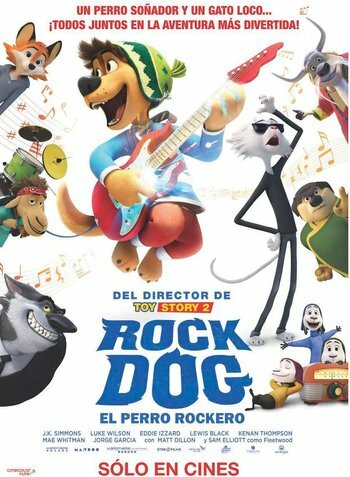 Rock Dog is a 2016 Chinese/American animated film, very, very, very loosely based on the graphic novel Tibetan Rock Dog by Zheng Jun. In the isolated Tibetan village of Snow Mountain, a community of fun-loving, scatterbrained sheep divide their time between creating woolen garments and making music. In the backstory, a pack of wolves once attacked Snow Mountain, but were defeated by the village's protector, a proud mastiff named Khampa (J. K. Simmons). Now, the aging Khampa is training his son Bodi (Luke Wilson) to take over protecting Snow Mountain for him, but Bodi doesn't have the ability  or more importantly, the desire  to do so, especially because his passion is music. As a result, Khampa promptly decides to ban music from Snow Mountain and lock away every instrument in the village, but everything changes completely when a shipment falls out of a passing cargo plane. The crate includes a radio. When Bodi uses it to tune in a Rock & Roll station from a distant city, he's really hooked—especially after he hears the reclusive feline/British Rock Star Angus Scattergood (Eddie Izzard) being interviewed about his forthcoming single. Following the advice of wise village elder Fleetwood Yak (Sam Elliott), Khampa reluctantly lets Bodi leave for the city to find his passion, while taking his homemade guitar with him as well. In the unnamed city, Bodi eventually happens to make his way to Rock & Roll Park, the place where many aspiring musicians gather to ply their trade. He ends up meeting, and bonding with, two members of a nameless band, compassionate fox bassist Darma (Mae Whitman) and spacey goat drummer Germur (Jorge Garcia), but arrogant snow leopard guitarist Trey (Matt Dillon) refuses to accept him. Bodi also tries to seek out Angus, who repeatedly brushes him off until he hears the mastiff playing a catchy original song. Angus has to deliver a new single to his label in a few days, but he's suffering from Writer's Block, so Bodi just might come in handy after all. Meanwhile, Linnux (Lewis Black), the leader of the wolves who managed to besiege Snow Mountain last time, has his henchmen follow Bodi throughout the city in order to kidnap him and force him to disclose Snow Mountain's defenses. Can Bodi escape the wolves and save Snow Mountain, while being able to make his dreams of being a rock 'n' roll star come true? Adorkable: Bodi. Though he sometimes borders on Idiot Hero due to his naïveté, he's just so lovable that you can't help but want to hug him. All Drummers Are Animals: Subverted with Germur, who's a mellow, lovably eccentric New-Age Retro Hippie. All Guitars Are Stratocasters: Subverted. While Angus' main guitar is a modified "Scattercaster", he has a huge collection that includes many different models. Art Shift: The prologue is presented in a 2D animation style, much like Kung Fu Panda's opening was. Award-Bait Song: Even though it hasn't won any awards, "Glorious" can count as one. Backup Bluff: Part of Khampa's defense for Snow Mountain is to have a group of sheep disguised as him stand on guard alongside him so it appears they have an entire mastiff army protecting them. Badass Grandpa: Khampa, although he realizes he can't keep it up forever. Barefoot Cartoon Animal: Bodi, Khampa, Angus, The Grizzly, and the sheep villagers. Everyone else is a Fully Dressed Cartoon Animal. Battle of the Bands: Trey challenges Bodi to a shred off to see if he can get in the band. Bodi loses after he accidentally tosses his guitar trying to imitate Trey's more acrobatic moves. Bears Are Bad News: The Grizzly, a wrestler who works for Linnux, is The Dreaded as far as other wrestlers are concerned. Then Bodi winds up in a caged match with him...and escapes by using the holes he punches in the cage. BFG: Linnux's gang use a couple of non-lethal models as they attempt to capture Bodi. Big Bad: Linnux, the leader of the gangster wolf pack. Bilingual Bonus: Some of the characters' names (Bodi, Darma etc.) are based off of various aspects of Indian reincarnation. On the other hand, Khampa's name is a play on Kham, a ancient province of Tibet, and father. Break the Cutie: Happens to Bodi twice: first when he's publicly humiliated by Trey, then when he finds out that Angus stole his song and lied about even meeting with him in a radio interview. Buffy Speak: After he gets zapped by his own security system, Angus yells at Ozzie to bring a golf cart out to get him because he's "Been zapped by the doo-dah." Bodi's unable to convince his rocker friends that he's spent time with Angus until Angus shows up to the park with a present for him. Angus's boss thinks he's making it up about being abducted, although it's only because he's already endured Angus's Hurricane of Excuses for not delivering his new song. Cats Are Mean: A couple of mild cases. Angus is an ethically-challenged Persian, and Trey the snow leopard is a Jerkass. Chekhov's Gun: The Scattercaster. Angus makes a big deal about how rare, valuable and one of a kind it is and that Bodi is not allowed to use it. Bodi is using it in the ending concert to play alongside Angus. Close on Title: The movie's title doesn't appear until the very end of the film, before the credits scroll up. Cloudcuckoolander: Germur, most of the wolves, every sheep, Angus, Bodi to a certain extent... this film is full of them. Color-Coded for Your Convenience: Khampa's Iron Paw move produces a beam of red energy which drives away the wolves he hates by physical force. Bodi's impassioned guitar playing produces a beam of blue energy which makes people float until they're in a state of bliss. Concert Climax: Not surprising, considering the film's subject. Angus drives a double decker bus. Linnux and his Mooks use black Lincoln Continentals from The '60s. Cool Hat: Bodi's green Tibetan winter cap. Cool Old Guy: Khampa and Fleetwood Yak. Cool Shades: Angus wears them throughout the film, revealing his eyes only once. Corrupt Corporate Executive: Linnux, who acts more like a mob boss than the club owner he is. Country Mouse: Bodi is a Naïve Newcomer to the big city. Creator Cameo: Director Ash Brannon has a small voice role in the film as Ian. Determinator: Bodi does not give up on his quest to become a musician, or to gain the help of Angus Scattergood as his teacher. And when Linnux and his wolves threaten Snow Mountain, he's even more determined to stop them from killing the sheep. Disney Acid Sequence: Bodi has a very colorful one filled with music beats when he turns on the radio and hears rock music for the first time. The Ditz: All the sheep, and most of the wolves (Linnux and Riff are the exceptions). Don't Think, Feel: How the Iron Paw move works. Khampa's comes from his hatred and fear of wolves while Bodi's comes from the joy he feels from playing guitar. Khampa, at first, tries to teach Bodi his method, but eventually realizes that his son's heart simply isn't in it. Earn Your Happy Ending: Bodi goes through several days of humiliation and hopelessness, is ostracized by his father for his passion, and has wolves nearly massacre the Snow Mountain sheep. However, at the end of the movie, Khampa grudgingly accepts his son's music career; Bodi finds a band and they seem like they're going to be a hit under Angus's tutoring; and the wolves apparently give up trying to attack Snow Mountain, because Bodi also has a very strong magic attack. Easily Forgiven: Angus by Bodi, and later the wolves by Khampa at the end. Fake Band: Plenty of them in the Rock & Roll Park scene, one of which Bodi joins. None of the bands are ever given names. Fantasy-Forbidding Father: Khampa, who bans music from Snow Mountain, in the hopes of preparing his son as the next village protector. First-Person Peripheral Narrator/Fourth-Wall Observer: Fleetwood Yak, who narrates some scenes and occasionally addresses the audience. The Foreign Subtitle: In Brazil, the film is known as Rock Dog - No Faro do Sucesso (On the Trailnote the scented kind of Success). The Friend Nobody Likes: Trey serves as this for Darma and Germur, being a jerk who repeatedly pulls cruel pranks and humiliations on Bodi. At the end of the movie he's kicked out of the band while Bodi takes his place as lead guitarist and singer. Included in the onlookers of Riff and Skozz's failed attempt to capture Bodi at the bus stop, is a cat making a wedding proposal. Both parties stare in confusion. As Bodi tries to convince Darma and Germur that he knows Angus, the cat can be seen in the background trying to ward off Riff and Skozz's vacuum with Bodi's guitar. As the wolves are being levitated by Bodi's new found music powers, if you look closely you'll see that a few of them are casually enjoying the gentle ride. Furry Reminder: Somewhat given that the animals still act as they would in real life. For example, Bodi wags his tail when happy, Angus attempted to lick himself clean after getting out of a dumpster, the sheep bleat from time to time, etc. Gilligan Cut: In the middle of the movie, Linnux looks at a back view photo of Khampa and says "When I get a hold of your kid, you're not gonna know what hit you." Match Cut to Khampa in the exact same back view position and being hit in the left shoulder by a mannequin leg. Hard-Work Montage: Bodi and Angus writing "Glorious" together. Hedge Maze: Angus has one in front of his house as a security measure. The maze is populated by giant robotic mice that will chase intruders, and the whole thing can retract into the ground so Angus himself can bypass it to enter and exit his house. Heel Realization: Angus has one after he steals Bodi's song. It's brought on by his robot butler Ozzie motionlessly staring at him, as if in judgment. Ozzie is only doing this because his battery is running low. Still, it motivates Angus to become The Atoner. Idiot Hero: Bodi's not really stupid by any stretch, but he comes off as this mainly due to his naïveté and unfamiliarity with the city (to the point where he's never even seen a radio before, and instead refers to it as a "magic singing box"). Idiot Savant: Again, Bodi's more incredibly naive than stupid, but he's mentioned by Fleetwood Yak to be a savant on guitar, demonstrating his ability to write full songs in a short time. I'll Never Tell You What I'm Telling You! : While under the influence of the Tranquilizer Dart used to subdue him, Bodi says he'll never tell Linnux about Khampa's sheep army—which is all Linnux needs to know to start planning his next assault on Snow Mountain. Important Haircut: Khampa's mane of hair — common for Tibetian mastiffs — is cut off after he becomes more militant about protecting Snow Mountain. Jerkass: Trey mocks, humiliates and dismisses Bodi from the moment they meet. He pays for it when his band ditches him and replaces him with Bodi. Jerk with a Heart of Gold: After Scattergood has a change of heart due to what he mistakenly perceives as getting the Silent Treatment from Ozzie (it turns out that Ozzie's battery had run low), he decides not to send in the song and helps to rescue Bodi, even giving him his autographed acoustic guitar. Kid Hero: Although his age is not stated, Bodi looks and acts like he's somewhere in his early to mid-teens. Large and in Charge: Linnux, the largest wolf in the movie, is the leader of the wolf pack. Magic Music: See The Power of Rock below. A Minor Kidroduction: In the intro, Bodi is seen as a young toddler. Missing Mom: There's a photo of Bodi's mother in his bedroom, but her whereabouts are never mentioned. Bodi: Are you Angus Scattergood? Angus [sarcastically]: No, I'm his— [''a passing car honks out part of Angus's conversation''] — gardener! Bodi: Oh my gosh! I'm actually meeting Angus Scattergood's— [another passing car honks] — gardener! Mook Lieutenant: Riff (Kenan Thompson), who leads Linnux's mob. He's also the only one of them who even approaches competence. Naïve Newcomer: Bodi's upbringing in the quiet mountains hasn't done wonders for his knowledge of the rest of the world. While he's eternally optimistic, happy, and friendly to everyone he meets, he's been fooled by people who lie to him (such as Trey saying that Angus would love to be his music teacher when Angus is mainly a recluse who has a dedicated security system around his whole house), sets his expectations too high, and is easily taken advantage of given his gullibility. Never Bareheaded: Bodi never takes off his cap. Nice Guy: Bodi doesn't have a mean bone in his body and is never shown getting genuinely angry. Darma and Germur also qualify. No Flow in CGI: The long flowing manes associated with Tibetan Mastiffs are only seen in the 2D Art Shifted opening; Khampa has cut his hair off in the present day, and whatever hair Bodi might have is kept under a hat he never removes. Noodle People: Angus is the skinniest animated character since Jack Skellington. Papa Wolf: Khampa, ironically, since he's a Tibetan mastiff and his nemesis, Linnux, is a wolf; When Linnux comes rushing at Bodi, Khampa blasts Linnux out of Snow Mountain with his Iron Paw move. Parenthetical Swearing: When Ian gives Angus Scattergood three days to deliver the song, Angus tells him to "chill the fudge cake out". When he's having technical difficulties with the tape's playback, Angus mumbles something unintelligible that sounds like "Mother... father!" The Power of Rock: The subject of the film. Bodi weaponizes it at the climax. Unlike Khampa's Ball of Red Energy, Bodi's is more of a magic wave. Properly Paranoid: While many characters accuse Khampa from being overprotective and assume the wolves are gone for good, as soon as Bodi leaves it turns out the wolves have had Snow Mountain under surveillance the entire time. Punny Name: Yes, Fleetwood Yak. Reasonable Authority Figure: Even though Khampa is strongly opposed to the idea of Bodi playing rock music, he decides to give Bodi a bus ticket to the city to follow his dream, reminding him that if he fails, he is to return home and there would be no further mention of music. Red Oni, Blue Oni: The trope is interestingly reflected visually through the Flame. Khampa, being the strict, Properly Paranoid fighter he is, casts a heavy-hitting blast of red energy. Bodi, on the other hand, casts a comparatively mellow blue wave in the climax. The implication is that, while Khampa's powers are based in fear, Bodi's are based in love. Bodi also plays as the Blue Oni to Angus' more surly and panicky Red. Robot Buddy: Ozzie is not only Angus's robot butler, but his only companion until Bodi shows up. Rockers Smash Guitars: Angus tried to do this after a jamming session but fails to actually damage the guitar. He gives up after hitting it on the floor three times. A mild one in that whenever someone touches the gate to Angus's property, they're sent flying backwards into the house across the street, sending them pinballing around the place before shooting back and rolling to a stop on the pavement in front of the gate again. Both times this happens, the victim also hit a pane of glass being carried over to the house. Bodi goes right through it, but Angus splats against it (the workers carrying it simply flip it over to let him slide off). Stepping (or not stepping) on Angus' doormat. One of the sheep is a Neat Freak who's always in the shower whenever someone needs him. Sarcasm-Blind: Bodi seems to have this as he seemed to believe for a second that there's another monkey ringing the doorbell after Angus dryly answered as such since Bodi kept ringing said doorbell while hanging upside down due to the mansion's security system. Floyd was scared into wanting to become a barber by seeing pictures of sheep who go on too long without being shaved (which can actually happen to sheep and one of the main reasons they're sheared). Khampa attempts to scare Bodi into training to be a guard using wolf masks. It works, but he decides to give Bodi a chance to go fulfill his dream after he sees the chaos it caused. Sharp-Dressed Man: Linnux and his agents wear identical Men in Black-style suits. She's a Man in Japan: Carl, the sheep who's always in the shower, is a female in the Chinese dub named Xue'er. Sheet of Glass: When Bodi gets shocked by Angus' electrified gate, there's a couple of movers carrying a sheet of glass. When Bodi goes flying backwards, they manage to move it out of the way, but then Bodi slingshots back and goes through the glass, shattering it. Later, the same thing happens to Angus, only instead of breaking through the glass, he does a Glass Smack and Slide. Ship Tease: Darma calls Bodi cute in one scene. Snow Mountain's barber (or baa-baa, since he's a sheep?) is named Floyd, a reference to the Nirvana song "Floyd the Barber," itself a reference to The Andy Griffith Show's barber character Floyd Lawson. And then there's Fleetwood Yak (cue audible groan). Linnux: You know what? You two morons just lost your health plan, and your 401K's! And if you don't bring in that mastiff by the end of the week, I'm relocating you to new digs with bottom of the oceanfront views! The Smurfette Principle: The film has only two female characters who get more than a few seconds of screen time: Darma, and the unseen DJ who interviews Angus in one early scene. The DJ's role lasts about 30 seconds to a minute, and after that she disappears from the movie. So Proud of You: After Bodi uses his new, mystical guitar (which he received from Angus as a gift) to defend Snow Mountain village, Khampa gives Bodi a celebratory hug as he has just seen that Bodi's passion for music really paid off in unexpected ways. Sound-Effect Bleep: Played for Laughs when Angus and Bodi finally meet face to face. Angus: No, I'm his (car drives by: honk honk!) gardener! Bodi: Oh my gosh! I'm actually meeting Angus Scattergood's (honk honk) gardener! Sunglasses at Night: Angus is even seen wearing his sunglasses to bed. He only actually shows his eyes in one scene in the whole movie when he realizes Bodi might be in trouble and needs his help. Linnux's relationship with his gang. Even Riff, the most competent of them, has some boneheaded moments. When it comes to the other mooks you'd be surprised they're such a threat to the sheep, such as one moment when they surround Bodi and try to tranquilize him...and all wind up shooting each other when Bodi ducks. Khampa's relationship with the sheep that he is protecting. The sheep are so scatterbrained that they forget that Bodi has left the village and that they organized and threw a giant party for him by themselves. Khampa wonders aloud how his son even kept looking after them after a week. Tap on the Head: A literal example in which Angus is immediately knocked out by a baseball bat merely touching his head, accompanied by a very light 'bonk' sound effect. Those Two Guys: Riff and Skozz. Top-Heavy Guy: Khampa and Linnux have large torsos and small legs. Training the Peaceful Villagers: Khampa tries to forge the sheep of Snow Mountain into an army, but they're too bumbling to pull it off. He settles for simply having them pretend to be a capable army to deter anyone spying on them. Unnecessarily Large Interior: Angus' house. The guitar room alone is at least 3 giant cubes tall, with 15 rows and 13 columns (or 195 guitars) per cube side. There's also a room which only showcases his double decker tour bus on a rotating pedestal. The Voice: Angus interacts with two of them: the DJ who interviews him, and the label executive who keeps harassing him for the new single he owes the company. The Voiceless: Riff's partner, Skozz. There's even an argument between the two where he doesn't even pantomime a response. Wolf in Sheep's Clothing: Three of the sheep become these when Khampa has them put on fake wolf heads in an attempt to get Bodi scared straight and discourage his son from becoming a musician. Women Are Wiser: Darma is the most sensible character in the story. World of Funny Animals: And it's populated by Petting Zoo People. Writer's Block: And a very realistic depiction thereof! Angus has to constantly beg his manager for more time to "tweak" his new song because he's having so much trouble just coming up with one. Jamming doesn't work and he can't write down or record the melody he comes up with in his sleep in time before it goes away (an extremely common frustration for musicians). At one point, he's seen with his head down on the piano, pounding the keyboard in frustration while surrounded by crumpled up notes. Yellow Eyes of Sneakiness: The antagonists of the film, the wolves, have yellow sclerae and are the only animals who don't have white sclerae. You Have Outlived Your Usefulness: After he's done with Bodi, Linnux puts him in the ring with The Grizzly. Bodi escapes, leaving the audience to wonder why Linnux didn't just shoot him; in Linnux's defense, he certainly didn't expect Bodi to survive.